WASHINGTON, DC -- When Ukraine’s border defense forces look east and south, they see nothing but Russian trouble. Russian troops on the eastern front continue low-intensity military operations against Ukraine. The White House is adamantly opposed to shipping lethal defensive aid with which Kiev could blunt the next Russian assault. Yet for one of the world’s most dangerous stretches of territory, the Ukrainians are woefully short of devices to spy on the other side to anticipate the next attack and spot intruders. Russian troops and their heavy weapons stand on Ukrainian soil, ready to invade at any time while conducting periodic low-intensity combat: a mortar shot here, a sniper’s bullet there. Ukraine has launched reconnaissance drones, but Russia is adept at hacking the aircraft’s software and guiding them back to President Vladimir Putin’s troops. As a makeshift solution, Ukraine took U.S.-supplied counterbattery radars and rigged them into a network through which commanders can watch some border areas. They are normally used to pinpoint the source of artillery or missile fire so it can be targeted. The White House is adamantly opposed to shipping lethal defensive aid with which Kiev could blunt the next Russian assault, but some help may be on the way. Rep. Duncan Hunter, a California Republican who toured eastern Ukraine this fall, has submitted a bill that tries to finesse around the White House ban. It authorizes the Pentagon to ship counterjammers to protect the drones and to supply early-warning sensors. Meanwhile, a California company is installing eight tactical towers this month along the southeastern border. Mounted on them will be infrared cameras, like the ones on surveillance drones, as well as radars that can monitor sea, air and land. But with a beleaguered State Border Guard Service, which has lost scores of troops in combat and is sometimes blind to enemy movements, any new equipment is welcomed. John E. Herbst, who directs the Eurasia Center at the Atlantic Council think tank, is a retired career diplomat and ambassador to Ukraine from 2003 to 2006, a pivotal time of a presidential election and subsequent Orange Revolution street protests. He says new surveillance equipment is “very useful” for two key reasons. 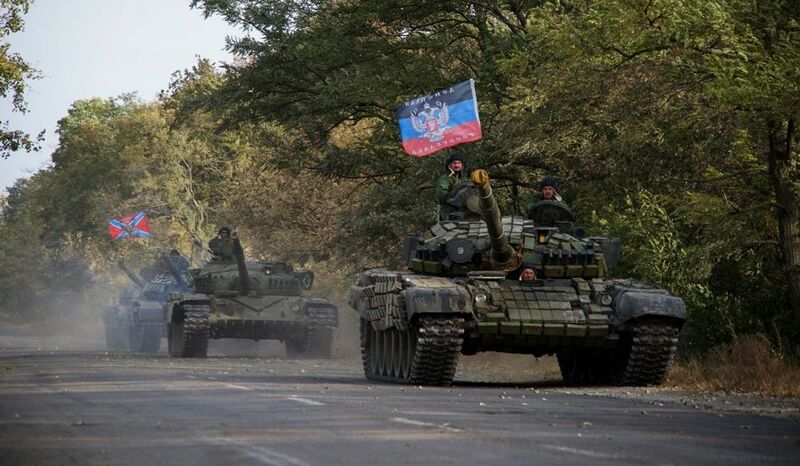 First, Russian troops on the eastern front continue low-intensity military operations against Ukraine. “Moscow has a huge edge over Kiev in border surveillance technology,” Mr. Herbst said. Second, Mr. Herbst said, a network of sensors would alert Kiev to Russian troop movements beyond the line of contact, allowing it to see forces flowing into the region. “If we provided Ukraine with intelligence assets enabling them to better monitor their border with Russia that is currently under Kremlin control, Kiev would have a much better idea of what equipment and soldiers are arriving in Ukraine from Russia,” he said. The Minsk Agreement of 2014 and February 2015 among Putin and European leaders has brought an uneasy lull in the fighting in the volatile, rebel-filled Donbass eastern region bordering Russia. The eye-opener for Mr. Hunter was when he broke away from State Department handlers in October and rode an old Soviet-designed helicopter to the eastern front. There, he saw little in the way of technology, besides binoculars, to watch the Russians. The Ukrainians told him Russia had stolen their drones. “The Russians, no joke, would not just take the drones down,” said Mr. Hunter, a former Marine Corps officer. Mr. Hunter said Ukrainian defense forces badly need lethal defensive weapons against one of the world’s largest armies. “They need the ability to take out Russian armor and not let them mass artillery fires,” he said. With the White House firmly saying no, even against advice from American diplomats, Mr. Hunter is trying a new tactic. His bill, which could become part of the fiscal 2017 defense budget, would fund jammers to protect the drones and different types of sensors. “We’re giving them as much as we can within the confines of the administration not really trying to help them,” he said. In the meantime, a private, State Department-approved transaction has a Montebello, California, company, Worldwide Aeros, set to erect eight sensor-mounted towers that would deliver immediate surveillance along the southeastern border this winter. “This system will provide a much more robust capability to detect incursions into their territory,” said Drew Shoemaker, vice president of government relations for Aeroscraft, a division of Worldwide. Ukraine eventually may opt for blimplike aerostats with even more powerful ranges. Worldwide Aeros was founded by a Ukrainian-born engineer, Igor Pasternak, who has won Pentagon contracts to develop different sizes and shapes of airships. After invading and annexing the Crimea Peninsula on the Black Sea in 2014, Moscow has designs on more Ukraine territory. Its ambitions were underscored last month with reports that Russian hackers disabled parts of the country’s electrical grid, causing massive blackouts. It is believed to be the first time a cyberattack has been able to bring down a centralized electrical system. It was likely in retaliation for Ukrainian operatives’ mission to blow up power lines to Crimea. The Minsk accords require Ukraine to monitor what is considered a “controlled” 1,200-mile border with Russia and another 250 miles that have no controls, plus a 120-mile stretch along Crimea.